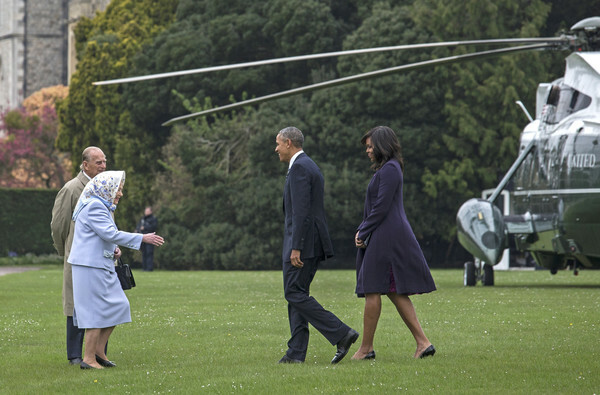 US President Barack Obama and his wife First Lady Michelle Obama are greeted by Queen Elizabeth II and Prince Phillip, Duke of Edinburgh after landing by helicopter at Windsor Castle for a private lunch on April 22, 2016 in Windsor, England. The President and his wife are currently on a brief visit to the UK where they will have lunch with HM Queen Elizabeth II at Windsor Castle and dinner with Prince William and his wife Catherine, Duchess of Cambridge at Kensington Palace. Mr Obama will visit 10 Downing Street on Friday afternoon where he is to hold a joint press conference with British Prime Minister David Cameron and is expected to make his case for the UK to remain inside the European Union.